I don't usually review anime titles volume-by-volume, but my rambling coverage of this one seems to be getting quite a few hits. I'd like to believe that means there are lots of fans overseas who are curious about the Japanese Blu-ray release for JoJo's Bizarre Adventure, so here are my thoughts on disc three! This third volume contains episodes seven through to nine of the 2012 television series, bringing the first part of the story to its close. The production quality is as high as ever; I cannot fault the artwork, animation quality or sound and the Blu-ray format presents the show the way it deserves to be seen. 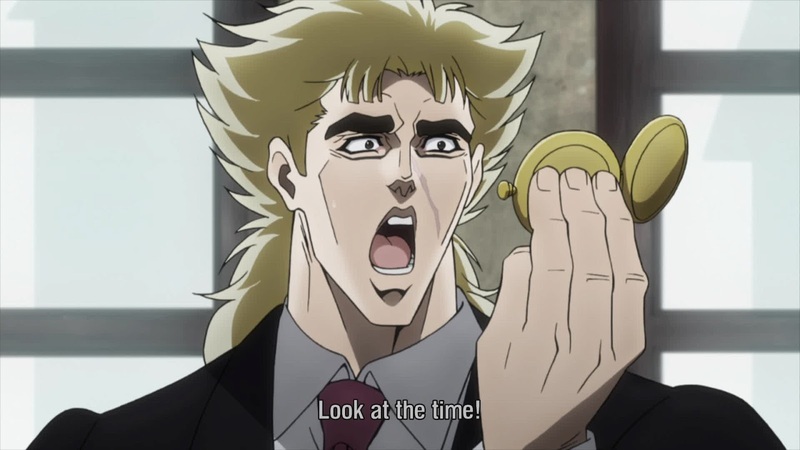 JoJo's Bizarre Adventure is definitely one of the most worthy Japanese imports in recent memory. The previous volume left off with the heroes battling against Dio's supernatural minions to try to stop a small town from being completely taken over. 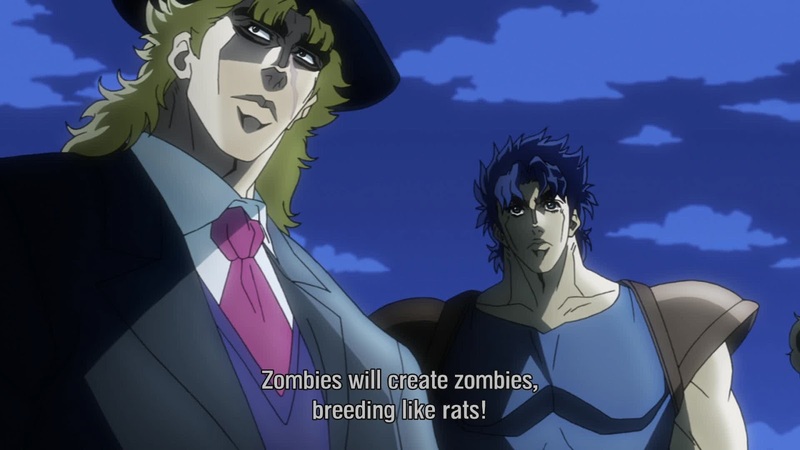 Even with JoJo's strength, Zeppeli's strange techniques and Speedwagon's, uh, cheering, the team have to make some dreadful sacrifices to make progress in their quest. The series continues to fly along at a brisk pace without ever skimping on battles, gore or shocks. 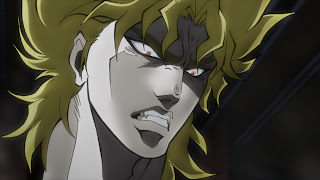 Things start to look up when JoJo and his friends meet some powerful new allies, but Dio is no pushover and the final battle is a cruel one. Fate is never kind to JoJo and his friends, no matter how righteous their intentions. As a newcomer to the series, there was always a danger that the Phantom Blood arc would seem weak next to the later parts of the JoJo saga that I'm more familiar with. Original creator Araki Hirohiko deftly avoids any potential pitfalls on that front; the final three episodes are a string of nonstop climaxes one after another. Anyone who has been watching this long is bound to be excited watching their heroes settle their long-standing grudges against one another in the manliest battles possible. Indeed, I say "this long", yet at this point the series has only been running for a few episodes. It's quite strange how quickly it's pulled me in and made me care about these crazy, melodramatic characters. I already know that the next arc is going to be great. However, it's a little sad to think that I won't be hearing the stirring JoJo ~Sono Chi No Sadame~ as the opening song any more. I'm not ready to say goodbye! 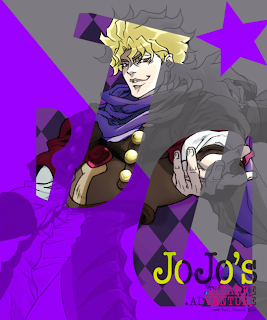 JoJo's Bizarre Adventure volume 3 was released on 29th March 2013 on special edition Blu-ray or DVD. The standard Blu-ray and standard DVD will appear when the first press versions have sold out. The first press DVD has its traditional bonus slipcase. The first press of the Blu-ray comes with the usual English subtitles and proof of purchase voucher. 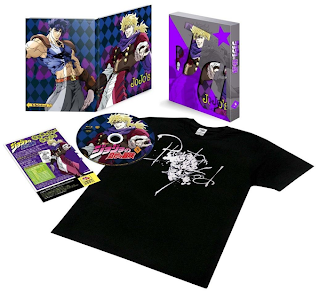 This time, it has a special commemorative Phantom Blood t-shirt as its unique gift with purchase - making the box much larger than usual. If you're ordering online please be aware that volume three won't fit through a standard letterbox. The English subtitles are, once again, well-written and just as good as those made for a localised western release. The only strange thing I noticed with this volume is that the name of the character who accompanies Dire is subtitled as 'Straizo', not 'Straits' as I'd have expected. This was presumably a deliberate choice in order to distance the series from the real world music references which creep into the majority of the character names. 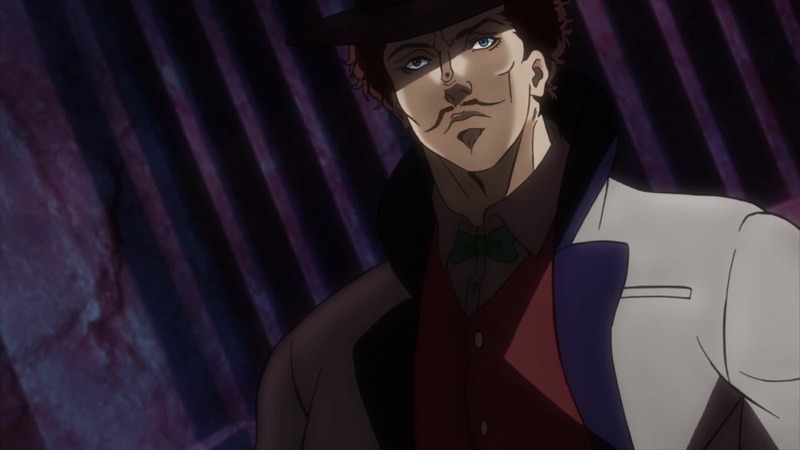 On-disc extras are the creditless opening and ending sequences for the Phantom Blood arc. With this disc the Phantom Blood arc reached its spectacular conclusion, delivering twists and turns every step of the way. Volume four will be the start of the Battle Tendency storyline which carries on all the way until the end of the JoJo television series. I'm looking forward to it!